Atom String Quartet is one of the most intriguing string quartets in the world, and also one of best Polish jazz bands. The group combines the capabilities of a string quartet (i.e. two violins, viola and cello) with improvisation in its broad sense. The set of instruments of a chamber music ensemble, which is most classic and firmly established in music tradition, enables the artists to search for new sound and formal achievements. It is difficult to define, in an explicit way, the music style of the group. Its music output, besides jazz, shows sources of inspiration coming from Polish folk, music of various regions of the world, and also contemporary and classical music. 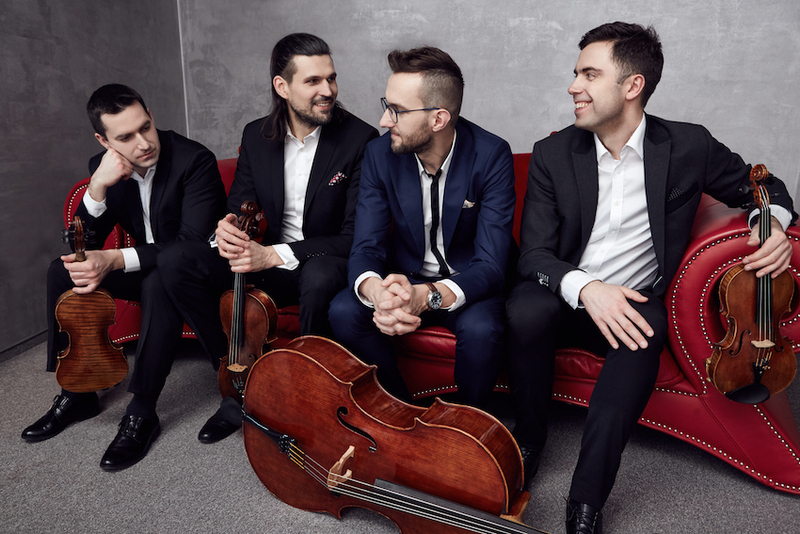 The quartet was established in Warsaw in 2010, and is created by the violinists: Dawid Lubowicz and Mateusz Smoczyński, the violist – Michał Zaborski and cellist – Krzysztof Lenczowski. All of them graduated from Warsaw Frederic Chopin University of Music. Since winning the Grand Prix of the 13th Bielska Zadymka Jazz Festival in 2011, the band constantly performs at the greatest music festivals of the world, such as: Berliner Jazztage, Jazz Baltica, Leipziger Jazztage, Cairo Jazz Festival, Katara European Jazz Festival, Festival Veranos de la Villa Madrid, Gaume Jazz Festival, Manchester Jazz Festival, Jazzycolors Festival Paris, Salzburger Festspiele, Jazz Jamboree and Solidarity of Arts. Atom String Quartet is also the first and only Polish group that played twice at the European jazz fair jazzahead! in Bremen (2015 and 2017). The group recorded four original records: “Fade In” – which received the Polish music award “Fryderyk” for Jazz Debut of the Year (2011), “Places” (2012) – which got “Fryderyk” for Album of the Year – Jazz (2012) and “AtomSPHERE”, which was nominated to “Fryderyk” for Jazz Album of the Year (2015). In 2017 the band released its fourth album “MERE” which was nominated to “Fryderyk 2017” for Jazz Album of the Year. That year also other two CDs were released, in which the quartet took part: a mutual record of Zakopower and Atom String Quartet and “Made in Poland” recorded with Leopoldinum Orchestra which was awarded “Fryderyk 2017” for Album of the Year Symphonic and Concert Music. Atom String Quartet received many awards, i.e. : “Grand Prix of Music Lovers Society” in the category New Hope of Music Lovers (2010) and Band of the Year (2016), “Gold Fiddle” at the 15th Polish Radio Folk Festival New Tradition (2012) and “Mateusz Trójki” (2015) in the category Jazz Music – Event. Since the beginning of Atom String Quartet’s activity its musicians gain high ranks in the survey “Jazz Top” of “Jazz Forum” magazine, including several times the first rank in the category Acoustic Band. In 2017/2018 season Atom String Quartet was the artist-in-residence in Mieczysław Karłowicz Philharmonic in Szczecin. The quartet cooperated with such artists as: Branford Marsalis, Bobby McFerrin, Gil Goldstein, Vladislav “Adzik” Sendecki, Mino Cinelu, Paolo Fresu, Leszek Możdżer, Lars Danielsson, Zohar Fresco, Jerzy Maksymiuk, André Ochodlo, Urszula Dudziak, Anna Maria Jopek, Marek Moś, Natalia Kukulska, Kayah, Aga Zaryan, Janusz Olejniczak, Krzesimir Dębski, Adam Sztaba, Grzech Piotrowski, Krzysztof Herdzin, Andrzej Smolik, and bands, i.e. : AUKSO Tychy Chamber Orchestra, Leopoldinum Orchestra, Sinfonia Varsovia Orchestra, Sinfonietta Cracovia, Radom Chamber Orchestra, Szczecin Chamber Orchestra, Elbląg Chamber Orchestra, Grzech Piotrowski World Orchestra, Sinfonia Viva, Sebastian Karpiel- Bułecka Highlanders Band.